April Wilkinson (left) and Professor Jeanette Wolfley published papers that were among the top downloads in American Indian Law in 2015. 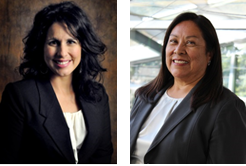 Third year UNM Law School student April Wilkinson and Professor Jeanette Wolfley published papers that were among the top downloads in American Indian Law papers last year. Wilkinson’s paper, A Framework for Understanding Tribal Courts and the Application of Fundamental Law: Through the Voices of Scholars in the Field of Tribal Justiceexamines traditional tribal justice systems set in tribal communities in an effort to establish a framework for understanding tribal courts and the unique challenges they face. The research presented describes a spectrum of traditional aspects within tribal courts and analyzes the impact that changing social dynamics have had on the tribal court construct. Wolfley’s article, published in December in the University of Pennsylvania Journal of Constitutional Law, You Gotta Fight for the Right to Vote: Enfranchising Native American Voters, reviews two major Supreme Court voting cases (Shelby County and Inter Tribal Council) and their impact on Native American voters in Indian country. It also examines the universal voting laws enacted by Congress and their application to Indian voters, and provides a comprehensive discussion of voting measures, actions and laws that should be considered by the federal, tribal and state governments to address the void left after the Shelby County case.